Blend in ginger, garlic & green chillies to a fine paste. Add in the chopped onions & allow it to sweat. Add in the blended paste to the onion & allow it to cook until the raw flavour is gone. Add in all the diced carrots, beans, cauliflower florets & green peas & allow it to cook. Mix in the boiled basmati rice & mix it well. In a separate pan heat little bit butter & fry in the raisins & cashewnuts & mix it with the rice. Pulav looks delicious n with plenty of veggies, really colourful to eyes..
Yum, so good with all the veggies, raisins and nuts!!! Sounds healthy, nutty and crunchy! 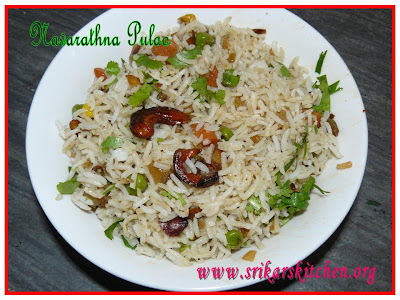 Colourful and very aromatic pulav Sri. Looks delicious. this is my fav. Looks so delicious and mouth-watering. veggies and dry fruits wow looks royal and yummy. Pulao looks fabulous Sri..love the presentation with nuts n raisins..
Pulav looks very tempting with all those vegetables. Lovely color of pulao. looks delicious. paakave supera iruku.. try panren eppova. All your pulaos look great - can't decide which ones to make first!